When you are hoping to maximize your travel security, one of the most obvious places to start is with buying a luggage lock. But how secure are luggage locks? The disturbing truth is that luggage locks are terribly insecure. What does the insecurity of these locks mean for your luggage security? How does that affect the protection of your property? In order to investigate these issues, we will have to venture deep into the terrifying truth about luggage locks. What security do TSA locks offer your luggage? TSA locks are not secure. The shackles can be cut by most low-quality diagonal cutting pliers, the lock cylinders can be picked open with very little skill, and the schematics for the master keys have been revealed to the public. If you are using a TSA lock, you are getting the illusion of security. The biggest benefit to using TSA locks is that the TSA can open your bag without having to break the lock. This still might not keep your lock from being cut off, as many travelers report having TSA cut locks off regardless of having been TSA approved. But at least there is a chance that your insecure lock will not be broken open. A TSA approved padlock is the next step up from a zip tie. It provides the same amount of initial security if you are worried about criminal tampering. However, a TSA lock can potentially be taken off and relocked on the bag, where a zip tie cannot be reattached once removed. With a TSA approved lock, after a lawful search, there is a chance that your luggage can maintain its same level of “security”. To Protect you and your fellow passengers, the Transportation Security Administration (TSA) is required by law to inspect all checked baggage. As part of this process, some bags are opened and physically inspected. Your bag was among those selected for physical inspection. If the TSA security officer was unable to open our bag for inspection because it was locked, the officer may have been forced to break the locks on your bag. TSA sincerely regrets having to do this, however TSA is not liable for the damage to your locks resulting from this necessary security precaution. The note goes on to suggest that the recipient of the inspection notice refer to www.tsa.gov to find “packing tips and suggestions on how to secure your baggage during your next trip…” Is it ironic for a note telling you what you just read to recommend that you use better security next time you fly? It may seem that way, but the spirit in which it is intended is that locks are not security, knowing what is going to get your bag flagged is the security you need for avoiding TSA attention. It is true that every lock can be picked, even locks that have not been picked yet can still be opened. Opening methods that travel security professionals use are almost always destructive. There is no lock that exists that can withstand every type destructive entry method given an unlimited amount of time with the lock. Not even the best padlocks in existence can hold up to the highest level of pressure that can be applied to them. Do not expect that your security can keep out any law enforcement. Even though you may be hoping to avoid criminally minded baggage checkers, they are within their right to open your luggage at all costs. Though there are documented cases where strong enough security has been enough to have TSA give up on trying to open it. I don’t fully understand the implications of security that has law enforcement give up, but I would not expect to be the exception to the rule that if the opening of your bag a legally sanctioned it will be carried out. In terms of criminal threats without the full force of the law behind them, your locks can still be opened. 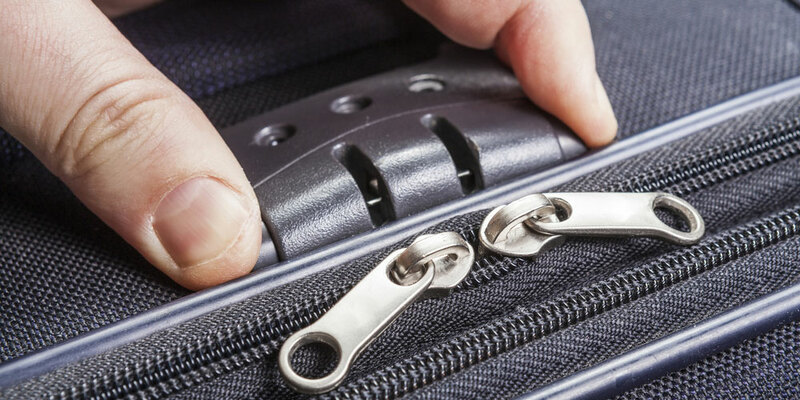 However, when it comes to standard criminals you have to consider every aspect of luggage security and not just the security of your luggage locks. Any luggage lock that is placed to secure a zipper is completely useless. Anyone with a ballpoint pen can puncture the zipper track (aka teeth). This gives anyone access to the contents of your bag in seconds. Once a person has rooted around in your belongings, they can then move the zipper’s pull tab over the open teeth and reseal the bag without any sign of entry. If you have an anti-puncture zipper, then your zipper is safe, but a lock can never protect the zipper. When you want a lock to matter at all, you have to use luggage that has hasps, not a zipper. Hasps are common on hard shell cases, which are intended to protect the contents of the luggage. It is also unlikely that you will end up with a bag that has an anti-puncture zipper if you do not go out of your way to purchase one. This feature is not common, in spite of the fact that the method of entry is extremely popular for criminals all over the world. Security is not the main concern for standard baggage manufactures. Unless the luggage has been designed with security in mind, the lock you place on it is not going to matter much at all. Besides zipper protection, you have to be concerned about more brash criminals that will not care about surreptitiously or even covertly open your bag. A very common method of entry that criminals will use is to cut your bag. You made need something like a Pelican case. With a light slice from a sharp knife, a thief now has access to everything in your luggage. Unless your bag can resist cutting, having a lock on your bag is not going to truly protect the property inside. Most likely your bag is always going to be easier to break than an incredibly strong lock. It does not make sense to have an extremely powerful lock if the case it is securing is itself insecure. Be aware of the level of protection provided by the bag before you make any investment in a lock. This is a guiding principle more than a hard and fast rule, but it is important to think about the fact that almost any piece of luggage you buy is not going to have high-security locks. This might be something that the case claims, but you need to know better than to believe the advertising. Even if the brand of security being used is not notorious for manufacturing subpar locks, it might still be something cheap and ineffective. A lot of times locks on cases and luggage will claim to be high-security, but they are just using a novel lock type. Such lock types that are used as built-in luggage locks include tubular locks, cruciform locks, and disk detainer locks. If a lock is poorly made, it does not matter what kind of internal components it has. Poorly made locks are not secure. They break easier because of the lower quality metal, and that means they can be broken open easier. Mass production required to place them on luggage also makes keys very simple to the point where most of these locks can be opened with bypasses or improvised keys. What is the best way to protect luggage? As you may have learned from the article about protecting your beach bag, the best possible way to protect any luggage is to keep your eyes on it. This is not going to be possible at every point of your trip, especially if you have to check your bags. The important thing is to take advantage of the instances where you can watch over your property. Your locks need to take as long to open without permission as the average time you will leave them unmonitored. As has already been established, flying in the United States will be the exception to this rule. Law enforcement will have too much time with your luggage, and they will have the authority to open the lock. But for deterring criminals, this type of security assessment is a must. It doesn’t matter if you are in one of the most dangerous countries in the world, or you are sleeping over at a friends house in the next town over, when you have luggage, you will attract the attention of criminals. 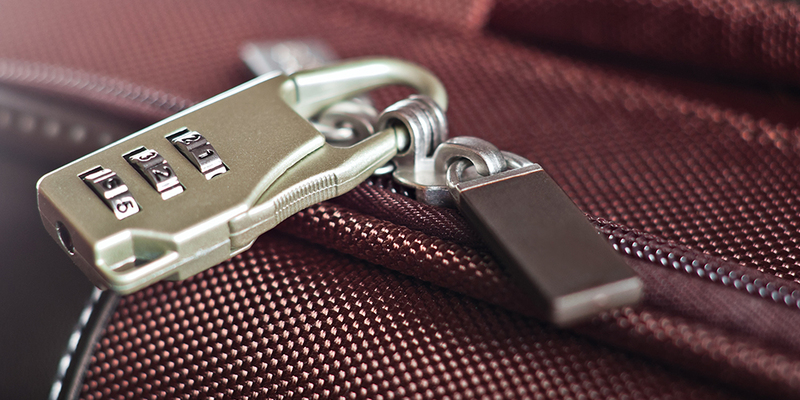 Luggage locks are not going to do much to protect your bag. You need to consider a lot more than just luggage locks.